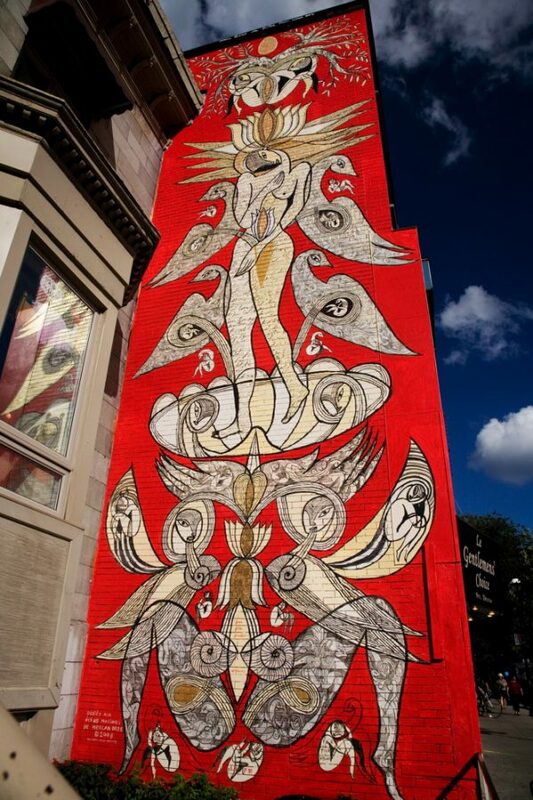 The artist Carlito Dalceggio was asked to create a 12 by 5 meters mural in the Latin Quarter based on the theme At the heart of cultural creation. Using his distinctive vivid and whimsical iconography, the artist chose to express the given theme by creating his own interpretation of Boticelli’s Venus, the quintessential muse and source of inspiration for all creators. The muse also symbolizes culture: the writing on her body evokes the Latin Quarter’s literary heritage. Atalas, the tribal hermaphrodite, holds up the Earth represented by a seashell. The tribe of ancestors conveys artistic revival, a creative evolution, which pushes tradition forward.